The Complex EOS Generali was designed for good environmental performance, generating energy savings up to 25 percent. Innovation at Microsoft goes further than just technology. The company's European headquarter — the EOS Generali complex, designed by Arquitectonica, architecture and interiors, and built in Issy-les-Moulineaux, Paris — is a leading example in ecological and sustainable material. With a total area of 45,000m², the complex comprises three building united by patios and was conceived to obtain optimum environmental performance, generating energy savings of more than 25 per cent — with an evident reduction in costs for Microsoft. 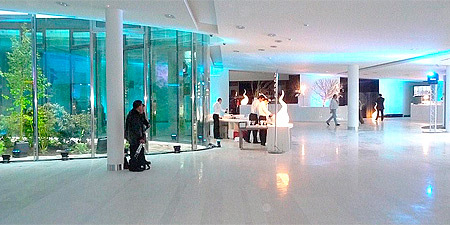 Radiating panels for air conditioning, 2,8m tall metal ceilings, low pressure fresh air system and adjustable window tiles all contribute towards energy economy, as well as a 12cm elevated floor, built with two varieties of light coloured limestone — Moca Creme and Beige Fino, both supplied by SOLANCIS. This, and other features, led the ASSOHQUE, a French association which verifies environmental quality, to classify the building with Elevated Environmental Quality. The EOS Generali is also attested with the BREEAM, the oldest and most used certification method for sustainability.